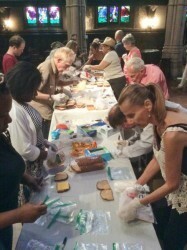 Following our two Sunday morning services on June 21, the congregation was invited to form an assembly line of sandwich makers that stretched across the chancel, with the altar of communion at the center, to celebrate the second anniversary of Sandwich Sundays, our successful outreach program. Each Sunday, our volunteers contribute sliced bread, sliced cheese and cold cuts to make sandwiches that are distributed to homeless and struggling guests of The Gathering Place, a CAMBA drop-in center Brownsville/East New York. Since February 2013, we have made and delivered more than 4,000 sandwiches. On this special Sandwich Sunday, parishioners made, bagged and labeled an additional 207! There will be many more to come. It was fun, too! Take a look at the photos here.